For more info about these screens, please refer to the CryptUp Help pages on this site or download the file and open it in your computer - no installation required. 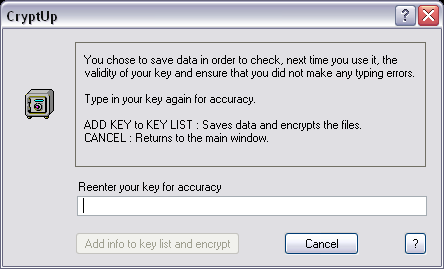 The first time you use a key, you will be asked if you want to save data in relation to the key to make sure, next time you use it, that it is one of the keys you use regularly and that you did not mistype it. Then you will be asked to type in your key again for accuracy.